UNITED STATES DEPARTMENT OF AGRICULTURE AGRICULURL RESEARCH ADMINI STATION BtRAU OF ENTOMOLOGY AND PLANT QUARANTIINZ Washington 25, D. C.
The information contained in this summary was compiled from material received ,from the plant quarantine official of Indiana and has been approved by him,. It is issued for the convenience of plant quarantine. inspectors; shiIppeis, transportation agents, truckers, and others concerned in the interstate movement'of plants, plant products, and other materials subject to State regulation on account of plant pests. Pursery stock into that State. An appendix furnishes information on postOffice requirements'for mailing plants as well as terminal-inspection procedure. This summary does not include digests of nursery-stock and plantquarantine requirements relating to the movement of plants entirely within the State. Washington Street,' Indianapolis 9, Indiana..
consideration applicable plant quarantines of the United State Department of Agriulture. 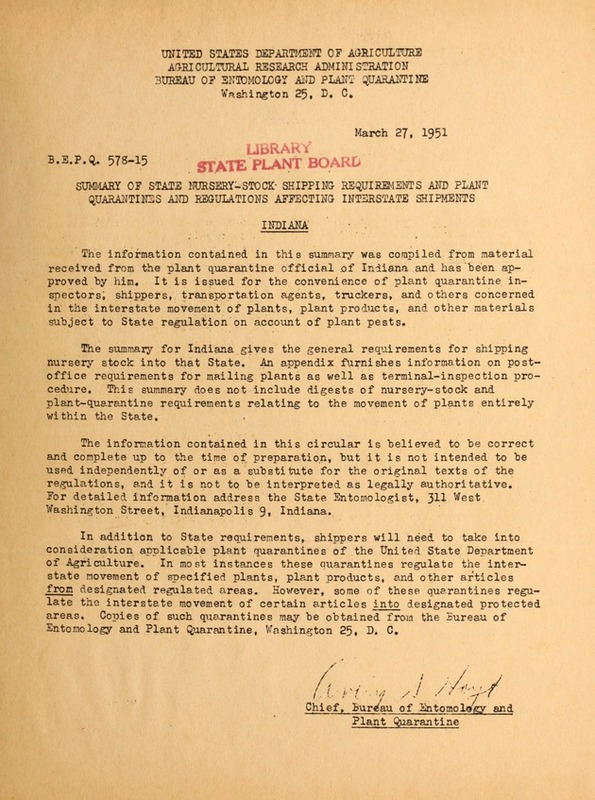 In most instances these quarantines regulate the interstate movement of specified plants, plant products, and other articles from designated regulated areas. However, some of these quarantines regulate the interstate movement of certain articles into Iesignated protected areas. Copies of such quarantines may be obtained from the Rureau of Entomology and Plant Quarantine, W.ashington 25, D c.
General Shipping Requirements.--A nonresident nurseryman, dealer, agent, or other person desiring to do nursery business in Indiana may obtain a license upon filing a certified copy of his original State certificate with the Indiana State Entomologist. An agent or dealer must pay a fee of $1. All certificates expire on Angust 1 following date of issue. Dealers are required to give affidavit that they will buy and sell only inspected stock, and to submit names of nurseries from which such stock will be purchased. Each package of nursery stock shipped into the State must be labeled with the names and addresses of consignor'and coisignee and must bear a State-of-origin inspection certificate showing freedom from -destructive insects or fungus diseases. Nursery stock must be true to name and is subject to inspection upon arrival. Carriers are required to report uncertified shipments of nursery stock to the State Entomologist within 24 hourss of arrival and to hold such shipments for inspection at the expense of the carrier. Shipments free from dangerous-insects and plant diseases will be released to the consignebe, but infested or infected nursery stock will be destroyed. Indiana maintains no State plant quarantines affecting interstate shipments. The foregoing summary.was checked and approved on February 2, 1951, by'Frank N. allace, State Entomologist.